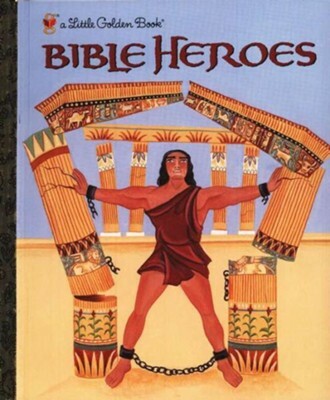 Old testament heroes and heroines come alive in this golden book. The stories of Samson, Deborah, David, and many others are told in a simple yet entertaining way, brought to life with lush, colorful artwork. Recommended for ages 3 to 5. Children have loved Little Golden Books for over 60 years. They have written their names inside each front cover and delighted in the colorful pictures and wonderful stories. Thanks to the happy hours spent with such books as The Pokey Little Puppy, many children have developed a lifelong love of reading. Old Testament heroes and heroines come alive in this exciting Little Golden Book of Bible stories. The tales of Samson, Deborah, David, and many others are told in a simple yet entertaining way, brought to life with vibrant pictures, sure to hold your child's attention. It's the perfect gift for Christenings and First Communions. Christin Ditchfield is a former preschool and elementary school teacher. Shes now a popular speaker and host of the internationally syndicated inspirational radio program Take It to Heart! A prolific writer of magazine articles and columns for CBA publications, shes also the author of the Little Golden Books Bible Stories of Boys and Girls and David and Goliath. She lives in Houston, Texas. Ande Cook is an artist who has illustrated a number of childrens books, including the Little Golden Book Bible Heroes. She is the director of teacher training at the High Museum of Art, as well as an artist in residence for the Georgia Council for the Arts. Cook lives in Georgia with her husband. I'm the author/artist and I want to review Bible Heroes - eBook.